What really is prayer and meditation? Well, I guess it depends on who you ask. I was raised Catholic and I was told to pray to God for things that I wanted. Well, after much thought, I realized, "Doesn't God already know what I want?" They were basically saying that if I didn't "pray" to God, He would be clueless as to my desires. That is ridiculous! Of course "God" or the "Universal Mind" or whatever you want to call the All That Is knows my desires! It knows it before I know it! Prayer is this: It is the direct application of our energy towards a goal, whether that be to acquire something or bring about a desired state (like praying for someone else to be healed). 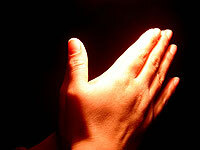 Quite simply, prayer is the directing of our energy. This is no different than the manifestation techniques I use to manifest my reality. When we go about our lives mildly wanting and wishing for things, our energy is like a light bulb for it is going out in 100 different directions and is almost useless. When we "pray" or purposely use manifestation techniques, we turn that same scattered energy into an exponentially more powerful energy laser. God already knows what you want, but you have to apply yourself and ask for it with energy defined by will and passion. In fact, the more passionately and fervently you wish for something, the greater the energy will be directed towards that goal. This is why I specifically state that the will power must be increased in order to manifest effectively. I also encourage you to create written goals, as those are "prayers on paper." You can't direct your thoughts if you don't even know what you want and articulate them. What do you want? Ịs it written down? Are you directing your will and passion towards it? On the other hand, meditation is the art of quieting the inner noise in the mind to allow the higher self to "descend" into your consciousness. Every moment of your life, your higher self (or God or whatever) is sending you messages about life, yourself, and the universe, but because the noise in your head is so loud and constant, you rarely hear it. By going within, quieting the chatter, you will start to experience such things as psychic messages, bi-location, parallel dimensions and more. You will start to broaden your sense of "self" and realize that you are more than your physical body and in fact, have no real boundaries! Eventually, you will experience the God state and be one with all things. Meditation mixed with things like prayer, light work or affirmations increase results in those areas as well. Meditation can be a primer for any of those things. Mediation and prayer are our natural tools to create and experience life more fully. Learn them, use them and expand your life.